Anita and Owen were married on May 29th, with a ceremony and reception at the Hyatt Regency Long Island New York Hotel in Hauppauge, NY. We started out the day with a first look surrounded by the bridal party and family, and then we took some family pictures as well as images with the bridesmaids and groomsmen. Then, we grabbed some pictures of just the two of them before the Baraat. 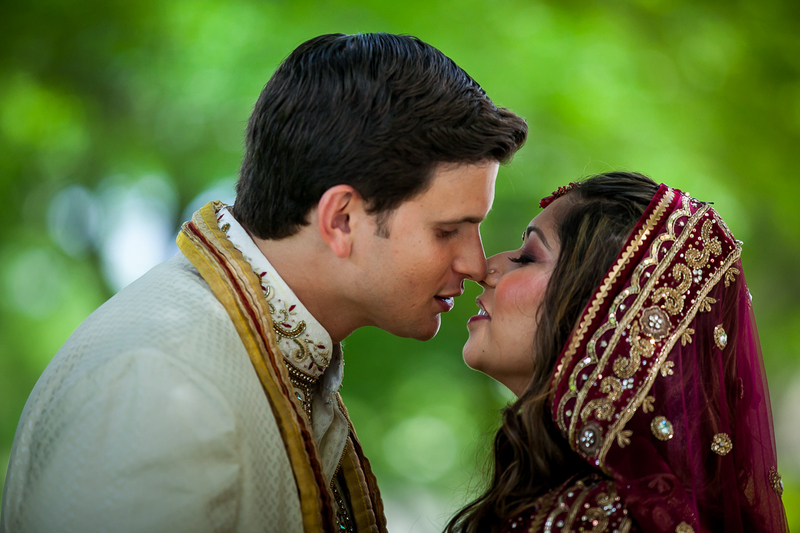 This was a stunning Indian wedding—and so much fun. There was a horse for the Baraat, but Owen’s groomsmen carried him the rest of the way once they got to the hotel canopy, since they thought it was probably best not to bring a horse in there. After the Baraat, there was a short ceremony with Owen and the priest before he led the procession into the ballroom. Immediately after the Indian procession and the ceremony, there was a lively cocktail hour for the guests while the bridesmaids and groomsmen changed into their outfits for the American procession. It was fun to get to see these two cultures blending together. After that, it was time for the reception. That’s always the fun part, especially during an Indian wedding! Anita & Owen, thank you again for allowing me to be part of this wonderful time in your lives. It was so much fun to be part of this wedding—and I wish you both the best in your future together.